I am a geek. I’ll say it loud and say it proud. I’m also an unabashed fan of hidden object games and have been since my very first Where’s Waldo book, so I was practically beside myself when I stumbled upon this fantastically quirky and impossibly cheerful hidden object game. 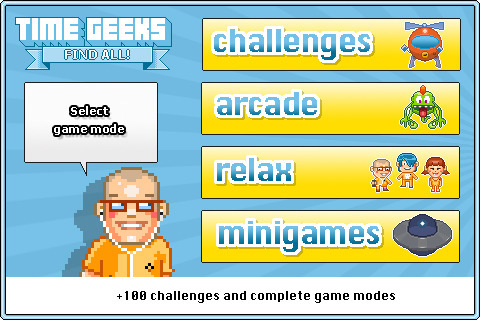 Time Geeks definitely knows its target audience well: retro pixel art, snazzy chiptune soundtrack, LOST references?! It’s like deliciously dorky manna from heaven. The unnecessary, but entertaining, backstory is that the evil alien Zoorgs have gone mucking about with the universe and dangerously distorted space-time. Various items, animals, and people have been scattered, and unless they’re returned to their rightful place in space-time, the universe will collapse. Thankfully, the heroic Time Geeks are on the scene to put everything right with their undeniably groovy 8-bit style. Hidden object games are usually almost always the same, but Time Geeks goes out of its way to defy conventions at every turn and breathes a boatload of cool into the stodgy genre. In addition to its unconventional and uber-charming art style, Time Geeks also tweaks conventional hidden object gameplay. Instead of giving you a long list of items to find, you get a limited amount of time to look for only one item at a time. Each scene is huge, wild, beautifully detailed, and enormously complicated, so finding the object can be quite challenging at times. There’s no real penalty for failing, and the item moves every time, but you get star ratings based on how fast you are, so time is definitely of the essence. As you progress, you also unlock about half a dozen extra minigames and different gameplay modes, including Challenge, Arcade, and Relax. There’s also an island editor where you can create your own little world populated by the many decorations and sprites you encounter throughout the game. The island editor struck me a little dull, but the minigames and various game modes were fantastic extras. Some were definitely better than others; some of the tilt-controlled games were especially frustrating, but overall, the minigames add a lot of overall value to an already stellar game. In case you couldn’t tell by now, I’m a huge fan and strongly recommend this one. Sometimes objects can be extraordinarily difficult to find, especially when clouds or the Time Geeks spacecraft float in the way and obstruct your view, and a few of the minigames are frustratingly hard, but don’t let that scare you off. This is an outstandingly fun game with a ton of replay value, oodles of bouncy charm, and a visual charm that is hard to top. It’s also OpenFeint and Game Center enabled, optimized for Retina display, and only $0.99, making Time Geeks a truly fantastic bargain. Whether you’re a geek or not, Time Geeks: Find All! is definitely a must have. 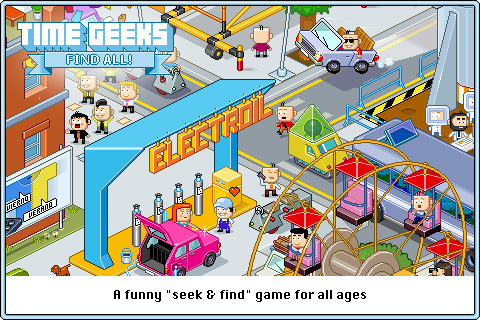 AppSafari review of Time Geeks: Find All! was written by Tracy Yonemoto on October 25th, 2010 and categorized under Action, Adventure, App Store, Featured, Fun, Games, Mini Games, Puzzler. Page viewed 3238 times, 2 so far today. Need help on using these apps? Please read the Help Page.